Powderhorn Park, pictured above, is located in what the Minneapolis Park Board in a "racially concentrated area of poverty." Coincidentally, many of its amenities are outdated. Photo by Cristeta Boarini. For the past four years in a row, Minneapolis has won the coveted title for the nation’s best parks. The Trust for Public Land gave the city a “five-bench” rating in May, edging out St. Paul for the top spot. To get five benches, Minneapolis received high marks in categories like per capita spending, median park size, and even the number of dog parks per resident. It’s a narrow focus, looking solely at parks acreage, money spent and how many residents live within a half-mile of a park – the rating system’s only nod to accessibility. What the rating doesn’t measure is racial and economic equity. These parks are in neighborhoods, and these neighborhoods are part of historical social and power dynamics that put sailing clubs and golf courses in some communities, and leaves rusted playgrounds and unkempt ballfields in others. Minneapolis may have the nation’s best parks, but best for whom? City residents and organizers have taken up this question to address racial and economic inequities within the Minneapolis Parks and Recreation Board’s more than 200 parks properties. Through popular education, putting pressure on policymakers and keeping the movement alive, real and local people have brought about changes not only in individual parks, but across the whole system. For residents like Arlene Zamora, the inequities between some parks don’t need to be measured to be noticed. It’s woefully apparent. “We’ve always felt that our neighborhood is cut off from other neighborhoods,” said Zamora, who has lived in the Beltrami neighborhood for more than 20 years. Beltrami is a small neighborhood located in Northeast Minneapolis. With about 47 percent of the population people of color, Beltrami is significantly more diverse than the neighborhoods directly surrounding. Last year, residents got word that youth programming for their local Beltrami Park was going to be drastically cut in their neighborhood – again, after having gone up and down for years. “It felt like we were being forgotten,” said Angella Khan, another 20-year Beltrami resident. When the residents reached out to the MPRB to save the programming and improve the park they “were met with some resistance,” recalled Vanessa Haight, neighborhood coordinator for the Beltrami Neighborhood Council. They were told that their youth programming was moving to nearby Northeast Athletic Park – where a new mini-golf course, renovated baseball diamonds and a new recreation center have all been built in the past eight years. The Beltrami residents asked the MPRB to hold a listening session with them so the park board could get a better understanding of the community’s needs. The MPRB declined. So Beltrami residents took matters into their own hands. They organized. They doorknocked. They showed up at meetings for the MPRB’s recreation community advisory committee. Last fall, they held their own listening sessions to prioritize Beltrami Park’s needs. This fall, Beltrami residents will celebrate the ribbon-cutting of their new picnic shelter, funded in part by a grant from U.S. Bank, the neighborhood council and MPRB. “The park board may have heard us before, but now they are listening because people have banded together. Equity has to be a part of everything moving forward,” Zamora said. 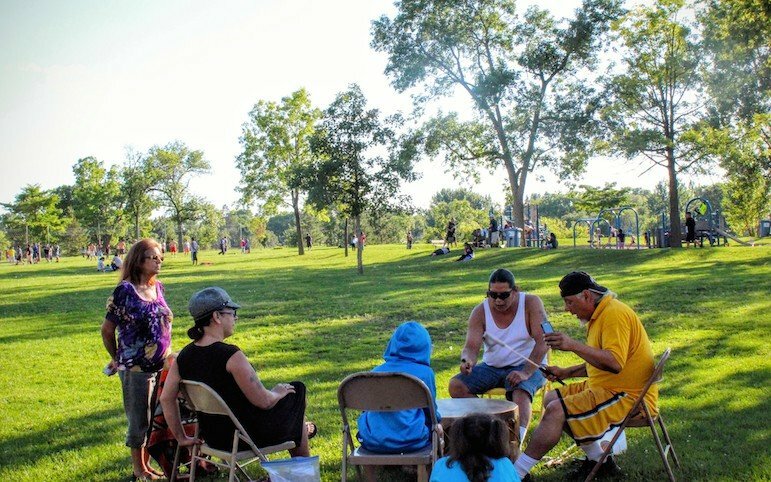 Pressure from communities like Beltrami and others in recent years has pushed the MPRB to big changes this summer: measuring inequity in neighborhood parks and planning for future projects with a specific lens on race and class. In light of an agreement with the Minneapolis City Council that increases parks funding by $800 million over 20 years, the MPRB approved the 20-Year Neighborhood Park Plan in July. The plan prioritizes improvements for the city’s neighborhood parks based on a 23-point scale with factors such as whether the park is located in a racially concentrated area of poverty, how big the youth population is in the area and the age and durability of the park equipment. The higher the score, the higher the priority to fix the park sooner. In addition to the neighborhood park criteria, the MPRB is implementing a Racial Equity Toolkit developed by the Government Alliance on Race and Equity (GARE) in pilot projects across the city, including the master planning for all parks in South Minneapolis. When asked whether the new tools will help MPRB “catch up” in areas of racially concentrated poverty, Arvinson pointed out that MPRB has not had the budget for maintenance citywide, so the MPRB is catching up across the whole system. And in fact, the parks in North Minneapolis received significantly more funding per capita from 2010 through 2014 ($243) than other service areas of the city, according to Arvinson. The 14th Avenue playground in Powderhorn Park was built in 1989. Photo by Cristeta Boarini. However, the neighborhood park criteria shows that equity disparities have existed further back than 2010. Even when there weren’t enough funds for the whole system, there has been particular disinvestment for parks in racially concentrated areas of poverty. 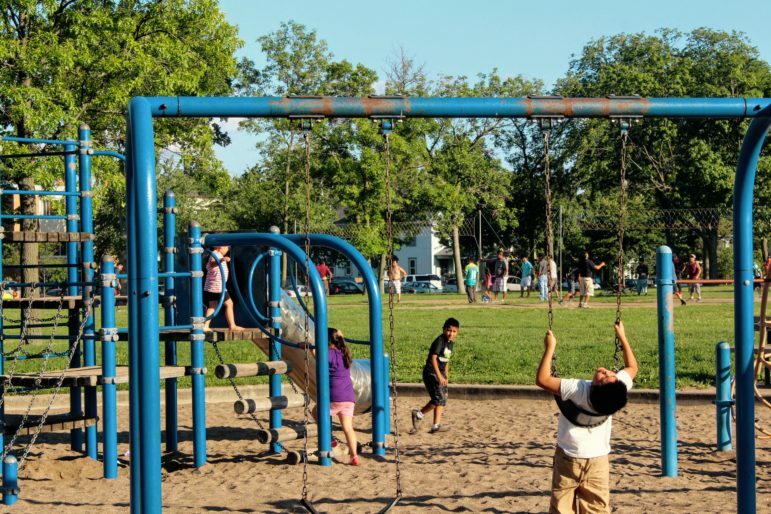 By the MPRB’s own measure, of the 25 neighborhood parks rated as highest priority through the new equity-based criteria, 23 are in North or South Minneapolis and are designated as racially concentrated areas of poverty. Eight of those 23 parks have equipment or buildings that are currently in use outside of their projected lifespans, which means the equipment should have been replaced years (and in some cases decades) ago, but hasn’t yet. Conversely, of the neighborhood parks with the 25 lowest priority, 21 are in Northeast or Southwest Minneapolis. None of those 21 parks have equipment in use outside of its projected lifespan. To put those numbers in perspective, the four playgrounds in South Minneapolis’ Powderhorn Park, surrounded by a neighborhood that is 53 percent people of color and 28 percent youth population, were built in 1989. The playgrounds are scheduled to only be partially renovated next year. Just across Interstate 35W, at Stevens Square Park, where only 11 percent of the population are youth and 60 percent are white, the playground was renovated last year. Pushing for equity doesn’t end with gaining access to better resources. When it comes to who makes decisions and how those decisions reflect the community, representation matters. Kate Beane is an enrolled member of the Flandreau Santee Sioux (Dakota) of South Dakota. Her people are descendants of the Dakota that founded Cloud Man Village on the shores of what is commonly called Lake Calhoun. “When I’m there, I felt at home in the space, but also at the same time not welcome. The way the distribution of wealth is and that neighborhood, how no one there looks like me, it just hammers home that our people were displaced so others could thrive,” Bean said. With a doctorate in American Studies and trained as a historian, Beane focuses much of her work on the preservation of the Dakota language. Last summer, when Beane heard the MPRB would be having a meeting to discuss changing Lake Calhoun’s name, she dropped everything to attend. But when she stood before the mostly-white park board commissioners and advocated for the name to return to its original, Bde Maka Ska, Beane said she didn’t feel as if she was heard. “Initially, I was really frustrated. These issues were being discussed without any notice. At the meeting, an argument was made that ‘Bde Maka Ska’ was too hard to say, so I had the commissioner repeat after me until she could say it,” Beane recalled. “I feel like we were getting the scraps again and being seen as secondary,” Beane said. “It’s an acknowledgement that we’re here. It felt so good to see our language, and to know I had participated and advocated for it,” Beane said. Beane is now working on the creation of a space on Bde Maka Ska to commemorate the Dakota tradition and history on the lake. Just two miles southeast of Bde Maka Ska, changemakers around Rev. Dr. Martin Luther King Jr. Park have advocated over the past six years for intentional African American representation at the park. In 2010, the MPRB was planning to create a dog park there, much to the chagrin of local African American residents. Richardson, who was born and raised on the Southside, said the people for and against the dog park fell largely along racial lines, with mostly white residents questioning why it mattered whether a dog park was there, and with mostly Black residents saying a dog park had no business on “sacred ground,” she said. The crude irony of having a dog park on the space named for King – when dogs are a symbol of the visceral opposition of the Civil Rights Movement – was unthinkable for Richardson and her colleagues. “But if you want something that matters, you have to organize. There was nothing really in the park or the programming that dealt with Dr. King’s life and legacy until we stepped up,” Richardson said. 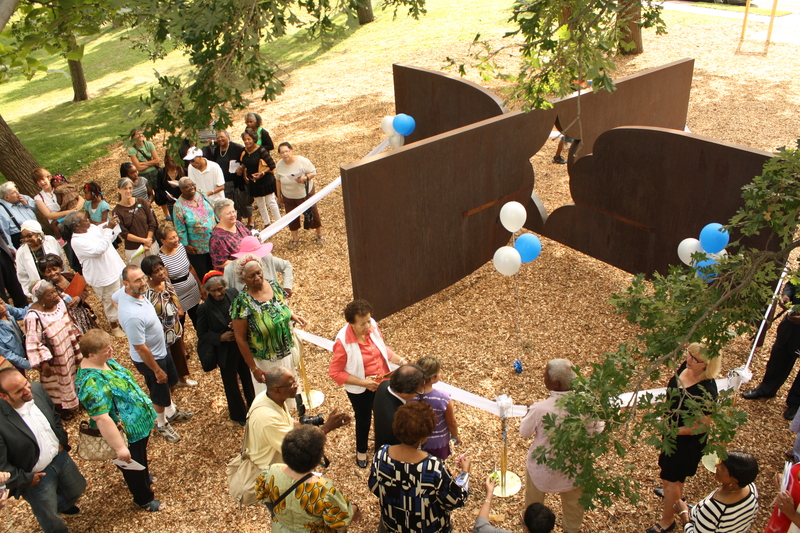 Celebrants gather around the “Freedom Form #2” sculpture in Rev. Dr. Martin Luther King, Jr. Park in Minneapolis in 2011. Daily Planet file photo. Their organizing efforts led to the formation of the Legacy Council that helps shepherd programming, art and equipment installations befitting the community and remembering King for his civic work and achievements. Statues, murals and benches honoring King feature prominently in the park, while the playground was designed as an ode to great Black thinkers and inventors, Richardson said. “We’re dealing with institutionalized racism, in a system that wasn’t built for us. Now we intend to stay organized until the park is everything we want it to be,” Richardson said. Even though the original goal of defeating the dog park has long been complete, the work for the Legacy Council continues, as does that of many organizations fighting for more equitable parks. Numerous organizations – including the Minneapolis NAACP and Voices for Racial Justice – and community members have taken up the mantle of organizing for parks equity. The growing coalition has drawn attention to the hiring practices of the MPRB, facilitated wide-reaching and accessible community engagement and much more. One of the central pillars of the movement is Parks and Power, born out of work through Hope Community, Inc. ’s Sustainable Progress through Engaging Active Citizens (SPEAC) cohort. The movement has been working in different forms for about 10 years, but on Dec. 17, 2015, Parks and Power officially branded and launched. “Parks is only an entryway to organizing. When people are disillusioned with their government, the answer is to turn hyperlocal. People light up when they hear that they aren’t alone,” said Jake Virden, an organizer with Hope Community’s Parks and Power movement. “A lot of people don’t even know that the park board is elected. We want to build a city wide base to affect the 2017 elections. We have a bold racial justice agenda that we will hold every candidate to,” Virden said. Parks and Power, and other organizers, have already been holding MRPB officials’ feet to the fire. On July 16, MPRB President Liz Wielinski and Vice President Scott Vreeland stepped down from their board leadership positions, citing ongoing racial justice pressures as the main concern. Both Wielinski and Vreeland are still serving as commissioners. Any positive movement forward is a good thing, Virden pointed out, but the work continues. By training people on how the MPRB was formed, where tax dollars go, how to navigate the jargon of public hearings and other key organizing skills, Virden said Parks and Power aims to help people advocate for themselves and their communities in the public sphere. Part of that work is making sure the meetings and trainings are accessible so more people can participate – with meetings at different times of the day, childcare for working parents, translation services for new immigrant residents and food to fuel the work. Recently on Aug. 11 and 12, Parks and Power had another set of its trainings, with the new, diverse participants now ready to train others on what they’ve learned. “Parks and Power can change your way of thinking. You start building a coalition with people, making connections of support. And when you build that base, it’s not just about parks anymore. It’s about housing. It’s about disability. It’s about jobs. All of us keep each other informed, and keep each other going,” Zamora said of her Parks and Power experiences. “What we’re doing here is what real participatory democracy looks like,” Virden said. I have lived directly across the street from Beltrami park for 15+ years and have seen this park disintegrate more and more every year! It is very sad to have seen more of it go away as things break down and not be replaced! The playground equipment is very old and has all been the exact same since I moved into the neighborhood and while it is nice to see the new picnic pavilion being constructed and some things finally being improved upon…there is much more improvement needed for this park. Our community is bordered by Hennepin Ave, Broadway Ave, Central Ave. and 35W so, for our children to have to cross these busy streets to get to NE Park or Logan Park to be able to play is very unsafe and our neighborhood has many children within its borders that deserve to have a well maintaned park to play in! While the embedded inequities and white supremacy of the institution you describe are discouraging, thanks for also sharing about the successes organizers have won! The MLK Park is super important on its own. The Webber Park Natural Swimming Pool is also an amazing new facility that has been really popular, serving a majority POC, very diverse community that is really embracing it (go if you haven’t yet!). I’m excited for the momentum to keep going and look forward to the Mpls Parks being the most equitable in the country. Thanks to Twin Cities Daily Planet for covering this story. I wouldn’t know this if it wasn’t for your publication. What a great picture! We were having a meeting about what is going on in Standing Rock North Dakota. What a beautiful park. I would love to talk with the writer and share our story. Perhaps if the MPRB actually asked the community what was important to them and what they wanted instead of dictating it, the solutions they provide may actually solve some problems! Thank you Cristeta and the Daily Planet for once again revealing the voice and aspirations of the community. I am a member of the Legacy Council and an ally for Parks and Power. Too often the story is told by the dominant institutions. This piece tells our story in our own words. Community Voices: 'Don't mourn, organize.' After the election, it's necessary to do both. I like the twist on the classic Joe Hill quote "don't mourn; organize." It's possible to do both. It can be necessary to do both.